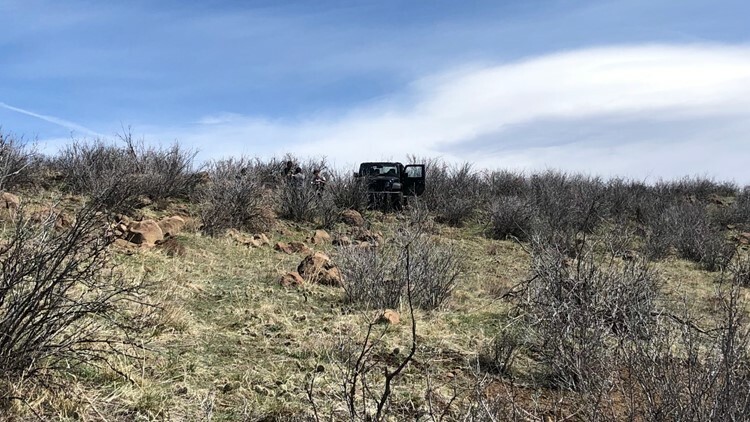 GOLDEN, Colo. — A driver has received a summons for trespassing and could face other charges after attempting to drive a Jeep up South Table Mountain Sunday morning and then getting the vehicle stuck. “I’m not really sure what really encouraged this operator to enter our parks in a motorized vehicle," said Mary Ann Bonnell, the Visitor Services Manager with Jefferson County Open Space. "It just seems beyond any of our comprehension why someone would do that." Bonnell said the driver, which they are not naming, drove all around the park on Saturday, got stuck on top of South Table Mountain, and then stayed there until the morning trying to get his jeep off a rock. Motor vehicles are prohibited at the open space, which in addition to being popular for hiking and biking, is also a habitat for cliff-nesting raptors, according to Jefferson County’s website. The jeep is still there, and Bonnell said while it is near a public trail, it is technically on private property within the park. It will be up to that property owner and the owner of the jeep to figure out how to tow it down. According to Jefferson County's rules and regulations, illegally driving on open space lands comes with a $100 fine. The driver involved in this incident received this punishment plus another $100 fine for entering the park after hours, and a $250 violation for reckless activity. South Table Mountain is one of the two volcanically-formed mesas just east of Golden. Part of the mountain is private property, and another area is used by Colorado State Patrol and the National Renewable Energy Laboratory. 9NEWS looked into this story after receiving photos from a viewer. Do you have something to share with us? Upload your photos and videos to yourtake.9news.com.